If you’re looking for a set of wheels to work with your new Avid BB disc brakes, look no further than the SRAM X.7 disc wheelset. 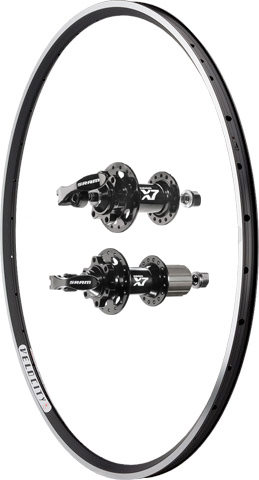 We take a set of Velocity Major Tom tubular or Velocity A23 tubular rims, lace them to a pair of SRAM X.7 disc hubs with DT Champion spokes and turn out a wheel that’s great as a low-budget, go-fast pair of wheels. Compatible with IS 6-Bolt disc rotors only. Compatible with Shimano and SRAM 9 and 10 speed cassettes.